Divides edges in the wire lying on the face or free wires or free edges with a criterion. Splits 3D curve and pcurve(s) of the edge on the face. Other pcurves which may be associated with the edge are simply copied. If 3D curve is splitted then pcurve on the face is splitted as well, and wice-versa. Input shape is not modified. The modifications made are recorded in external context (ShapeBuild_ReShape). This tool is applied to all edges before splitting them in order to keep sharing. Returns tool for fixing small curves. Returns the tool for splitting pcurves. Returns the tool for splitting 3D curves. Returns the tool for Transfer of parameters. Initializes by wire and face. Initializes by wire and surface. Creates wire of one edge and calls Load for wire. 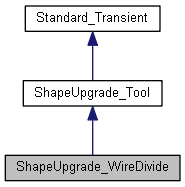 Computes the resulting wire by splitting all the edges according to splitting criteria. All the modifications made are recorded in context (ShapeBuild_ReShape). This tool is applied to all edges before splitting them in order to keep sharings. If no supporting face or surface is defined, only 3d splitting criteria are used. Sets tool for splitting edge. Sets supporting surface by face. Sets tool for fixing small curves with specified min tolerance;. Sets the tool for splitting pcurves. Sets the tool for splitting 3D curves. Sets supporting surface with location. Sets the tool for Transfer parameters between curves and pcurves.